The cocktail bar scene is one of the most attractive, followed and frequented by young people. There are so many cocktails that can accompany an aperitif or a dinner with friends. The cocktail is hence a drink enjoyed by many, but not all know how to prepare a good cocktail. Caffè Portofino prepares cocktails to perfection, so…if you are looking for a cocktail bar in Rome, you just have to come to us! Caffè Portofino has bartenders experienced in the preparation of colourful cocktails that will impress you with the spectacular mixing of alcoholic drinks, fruit and ice cream served in cute, colourful and exclusive Caffè Portofino tumblers. Often, cocktails accompany the aperitif, but other times they can be ordered individually and consumed during an evening with friends. With what does it all begin? 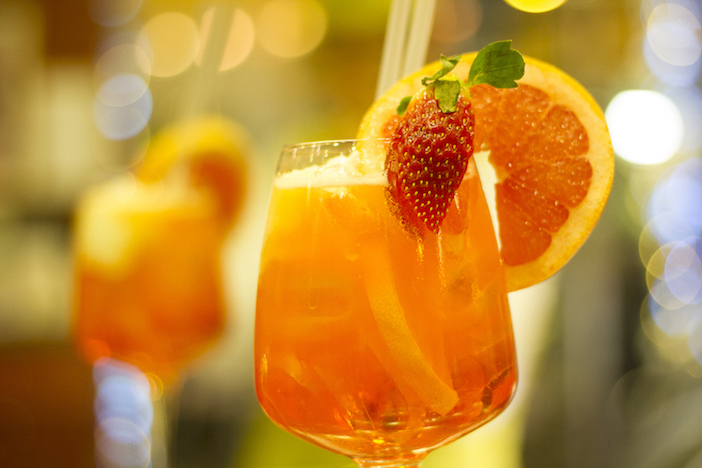 Naturally…with the Spritz Portofino, prepared with Prosecco, Aperol and lemon ice cream! The classic Spritz made with Campari and soda or Aperol and soda are close behind. But the cocktail list goes on and on! Caffè Portofino bears in mind those who like sweeter, slightly alcoholic drinks and proposes the Bellini, made with peach juice and Prosecco, the Rossini, with strawberry juice and Prosecco, the Mimosa, with freshly pressed orange juice and Prosecco, the Americano, made with Martini red, bitter Campari and soda and the Garibaldi, with bitter Campari and freshly pressed orange juice. Sport Man and Virgin Colada are the non-alcoholic cocktails par excellence. The first one combines orange juice, grenadine, grapefruit and tonic water to obtain a fresh and original drink for customers who do not like the taste of alcohol, but still want to enjoy a drink with friends. The second one, on the other hand, recalls the flavours of tropical fruits thanks to the use of pineapple and coconut. The perfect mix for those who prefer sweet cocktails. And for the young people that prefer alcoholic and more traditional cocktails to drink together with friends in order to start an evening of fun? Caffè Portofino and the assortment of its cocktail bar in Rome do not disappoint and have the perfect cocktail for everyone! From the Daiquiri, prepared with Rum, brown sugar and lemon, to the Long Island Ice Tea made with Rum, Vodka, Gin, Cointreau, lime and soda. From a classic Negroni, with Gin, bitter Campari and red Martini, to a simpler Screw Driver, born from the combination of vodka and orange juice. Certainly, one cannot forget the Tequila: an absolute must in the cocktail world and perfect in every combination. Its flavour can be enjoyed while sipping a Tequila Sunrise, where the strength of the Tequila blends harmoniously with the orange juice and grenadine that dampen its intensity. But we are not done yet. Tequila is also present in another cocktail: the Margarita. Here, the soul of the Tequila meets the sweet orange fragrance and velvety taste of the Cointreau, all rounded up with a touch of lime. The White Russian is ideal for those who want a more full-bodied and delicious cocktail. The coffee after-taste from the Kahlua blends with the sweetness of the cream and vodka to obtain a taste like no other. Caffè Portofino also prepares a variation of this cocktail without milk: the Black Russian, made with Kahlua and vodka for a stronger, more bitter taste. 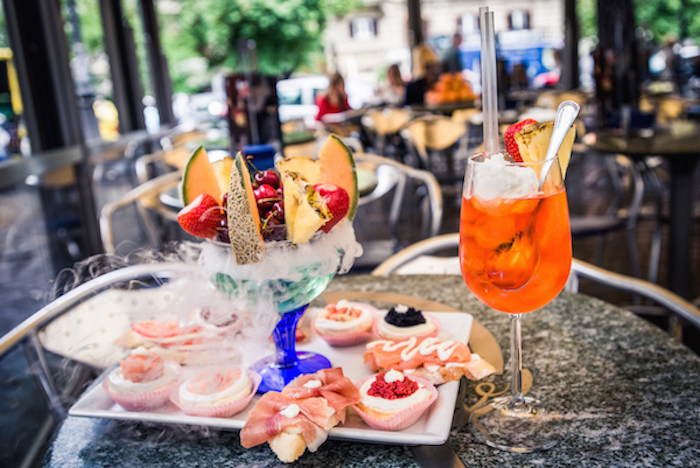 Amongst the most popular cocktails in Rome we find the Bloody Mary, the Caipirinha, the Strawberry Caipiroska, the Cosmopolitan and the Cuba Libre. These traditional cocktails have been reinvented at Caffè Portofino. In the Bloody Mary, the vodka is shaken with the tomato juice to obtain a unique taste which is particularly appreciated by young people, together with the famous Caipirinha made with cachaca, lime and brown sugar. Vodka is the main ingredient of two other very popular cocktails: the Strawberry Caipiroska, in which it is mixed with lime, strawberry and brown sugar, and the Cosmopolitan, where the vodka blends with cranberry juice and the delicacy of Cointreau. The Cuba Libre is specially appreciated by rum lovers. This cocktail is the result of mixing rum with Cola and lime.